Azerbaijani chess players Shahriyar Mammadyarov, Eltaj Safarli and Nijat Abbasov will vie for medals at the 78th edition of the Tata Steel tournament in Wijk aan Zee, the Netherlands from January 15-31. The tournament has two main player groups, each with 14 players. They are known as the Tata Steel Masters and the Tata Steel Challengers. 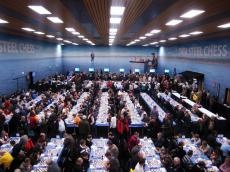 The Tata Steel Chess Tournament is one of the most prestigious events in the international chess calendar. The "Wimbledon of Chess" attracts the very best chess grandmasters in the world, along with thousands of amateur players, live event visitors and online visitors from around the world.